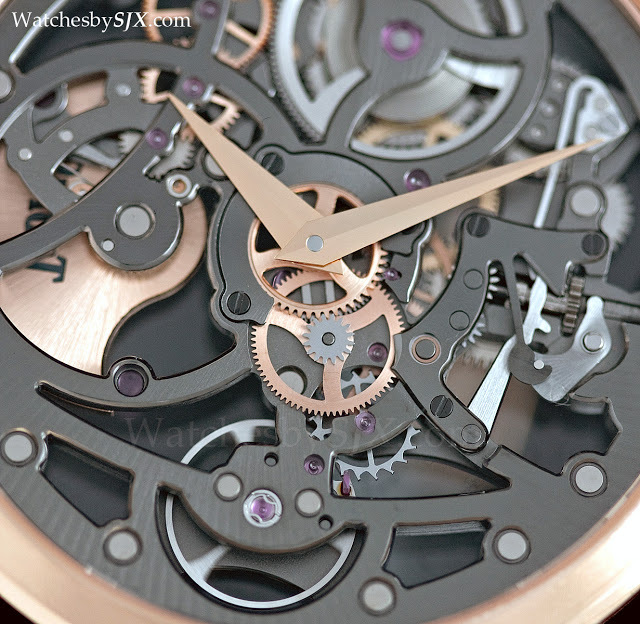 Introduced in rose gold for the first time at SIHH 2013, the Piaget Altiplano Ultra-Thin Skeleton exemplifies two elements of construction which have characterised recent Piaget movements – incredible slimness and open-working. 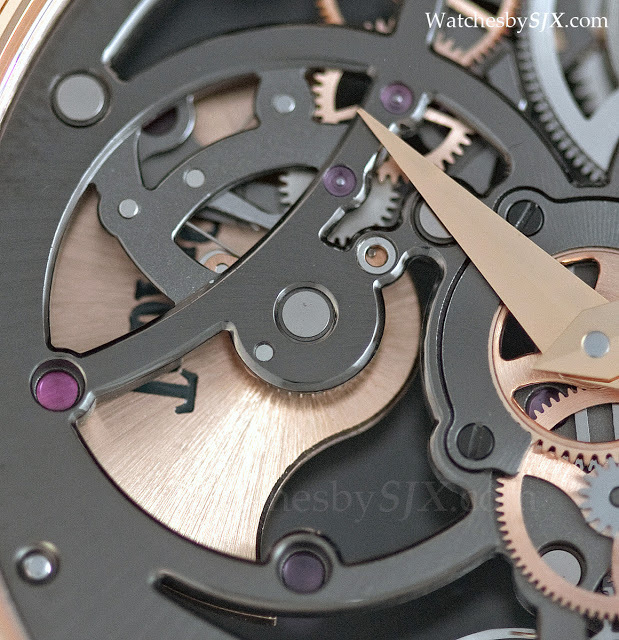 A large part of Piaget’s reputation as a watchmaker rests on its stable of ultra-thin movements, several of which hold records for being the slimmest in particular categories, including the world’s thinnest minute repeater. 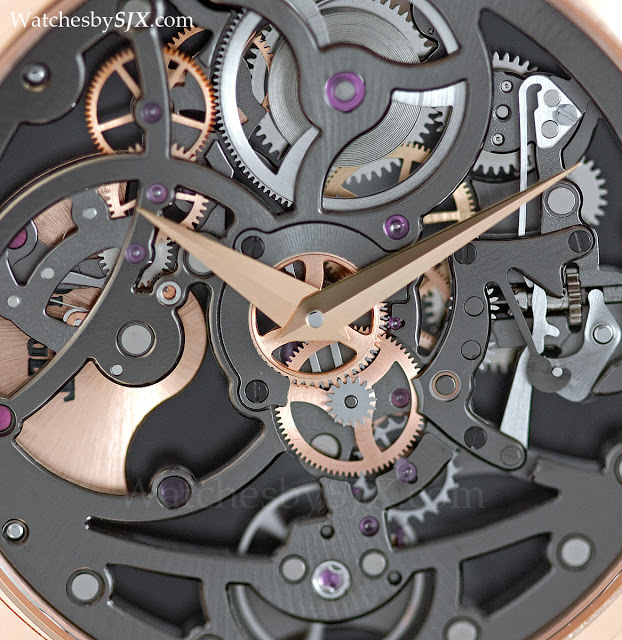 And the thinnest skeleton watch in the world is none other than the Piaget Altiplano Ultra-Thin Skeleton with the automatic 1200S movement – the movement is only 2.4 mm thick. 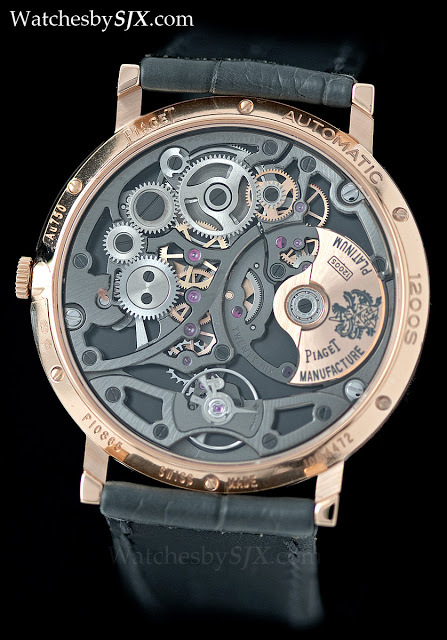 Previously only available in white gold (and a unique version in blackened white gold was made for Only Watch 2013, the Altiplano Ultra-Thin Skeleton was just this year presented in rose gold with a black PVD coated movement. 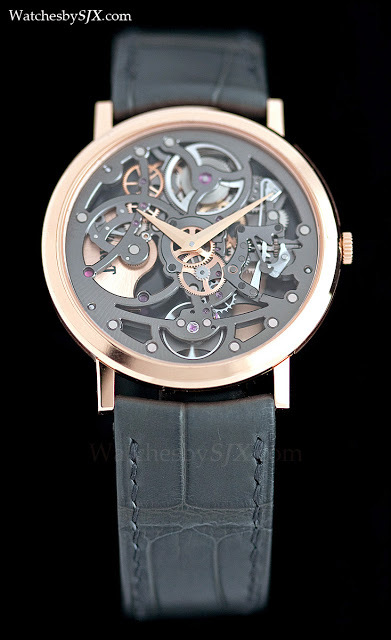 Measuring 38 mm and just 5.34 mm high, the Altiplano Ultra-Thin Skeleton qualifies as a formal dress timepiece. 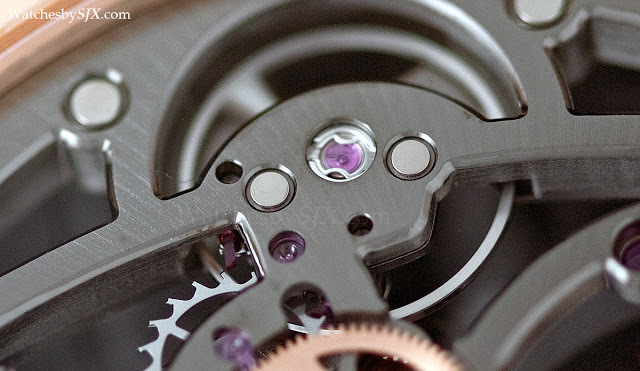 Because most ultra-thin movements are time-only, with just the hours and minutes, they are regarded as simplistic timepieces. 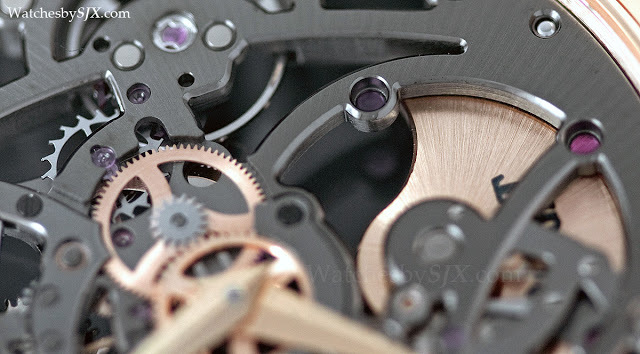 But the simplicity of function belies the complexity of assembling and adjusting such uncannily slim movements. Tolerances and tigher, parts are more delicate and the overall task requires quite a lot more skill. 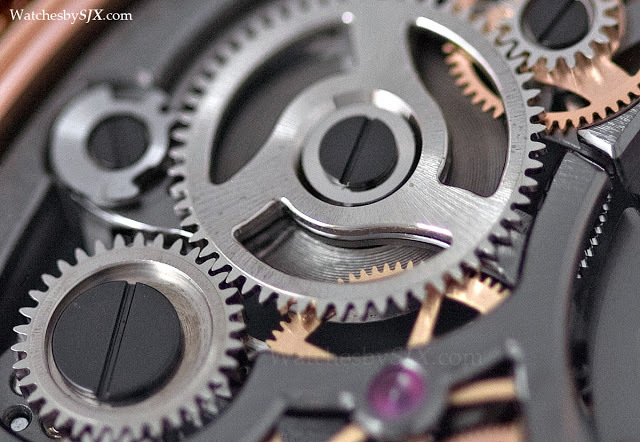 Though it is mechanically simple, the movement has plenty of detail to admire up close. 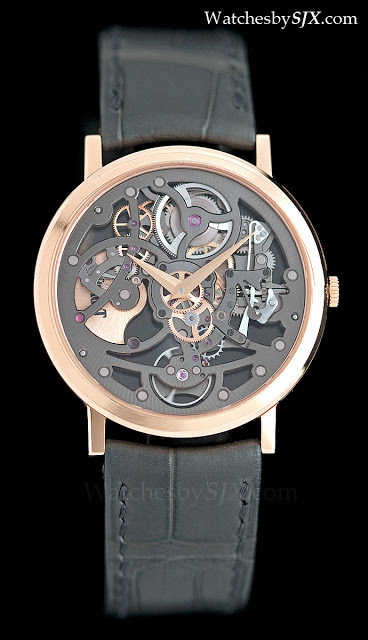 Like the other skeleton watches in Piaget’s line-up, the 1200S movement is open-worked in a contemporary style. 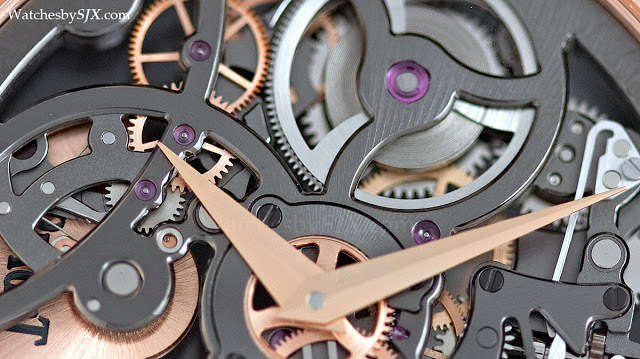 While traditional skeletonisation is all about fussy and flowery engraving, this movement emphasises geometric shapes, with clean lines and grained surfaces. 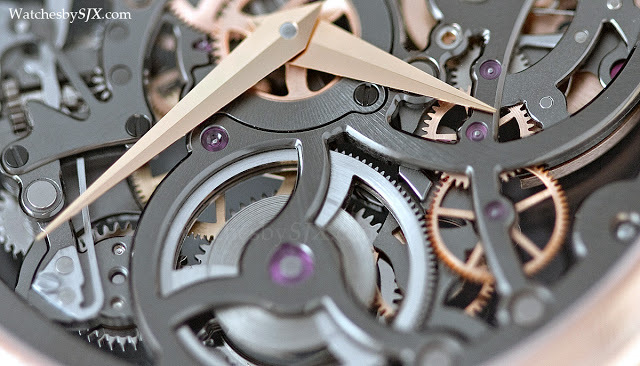 Carole Forestier-Kasapi, who is now in charge of movement development at Cartier, was responsible for Piaget’s skeleton watches before she joined Cartier, so there are conceptual similarities with the current Cartier skeleton watches. 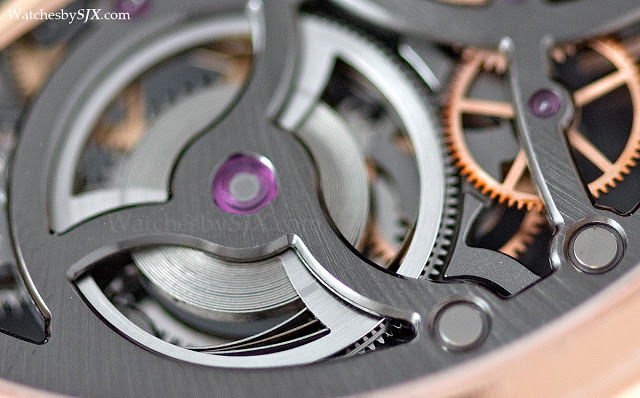 The movement, which is made in-house by Piaget, is finished to a high degree. However, the black PVD coating of the bridges means it has to be examined closely before the careful decoration is evident. Though the bridges are grained on the surface, the edges are all bevelled and polished. 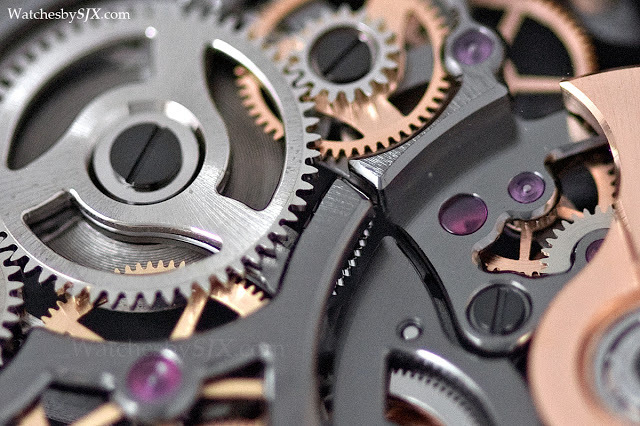 And the gears, both steel and gilded brass, are all similarly well finished. 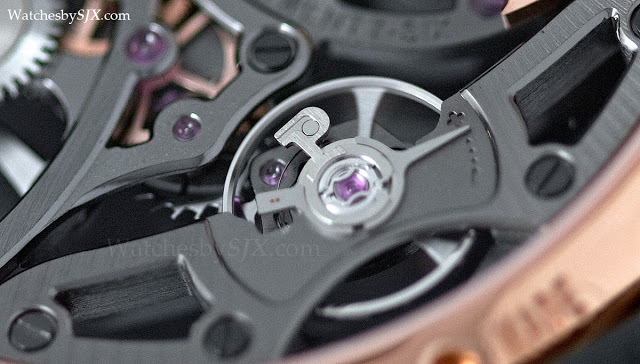 That being said, it is a shame that there are no sharp, inward corners on the bridge bevels, which represent an even higher standard of finishing (and is something which afflicts Richemont brands in general except for the very most expensive ones).